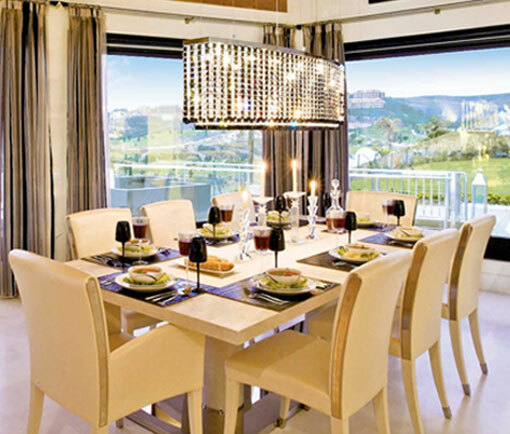 It’s holiday-high living for you, and you need a villa that oozes style inside and out. Our Luxury villa collection presents our stand out properties, where the finer things in life come as standard. What's more, when exploring each villa you'll discover those added unique details that makes each truly luxurious. With every comfort taken care of and first-class facilities, these indulgent villas make a beautiful backdrop to a fantastic holiday. Large private swimming pool, plump towels and crisp linen, decor to die for and lavish surroundings - all absolutely necessary for experiencing the life of luxury on holiday with James. What could be more fabulous? When personally handpicking our collection of luxury villas we focus on the deluxe criteria the property meets and how luxurious it feels to all of your senses! Apart from a stunning setting (which is an absolute essential), the interior will have to ooze style. We make sure those balmy evenings are cooled down with free unlimited A/C in bedrooms, while an en-suite or shower room is a must have. As a luxury guest with James, we know you will consider both the style of your personal villa as well as the view from the balcony. Whether you are looking for décor that ranges from sleek, contemporary minimalism, or you’re interested in a bit of traditionalist design, one factor overrides everything else, and that’s luxurious comfort! Chill out with a film on one of our flatscreen TVs, tune into the local or English satellite programmes, or use the iPod docking station and Bluetooth speakers to fill your luxury villa with your favourite music. One of the best luxury of a villa holiday is that you set your own timetable – and that includes mealtimes. Whether your culinary expertise is limited or you’re an accomplished chef, our luxury villas provide you with everything you’ll need in the kitchen. State-of-the-art appliances and devices feature, as well as quality utensils, crockery and cutlery. Indoor elegance should always be matched with outdoor style and sophistication. The trend for ‘outdoor living spaces’ means that a villa should flow effortlessly from indoors to outdoors. So when we pick luxury villas in some of the best locations around the world, they have to have that flawless cohesion between indoors and outdoor living spaces, allowing you to make the most of the warm and pleasant climate! Grab one of your free pool towels and lay out in the sun on one of the plush sun loungers. A luxury bedroom should always be a serene sanctuary that lets you wake blissfully at your own pace. It needs to be bright, airy and relaxed. We make sure those hot, sultry nights are cooled down too, with free unlimited A/C in bedrooms so you get a restful night’s sleep. The king sized beds in our luxury villas make it a place of true tranquillity. Soft pillows, high quality linen and a beautifully appointed room all make for the type of nights sleep only possible on a holiday. Back inside, an en-suite or shower room is a must have. So we make sure they’re filled with exclusive detailing and luxury fittings. Fluffy towels and high specification finishes - we know it's these little details that really matter when it comes to luxury bathrooms. We also know that you want your own space in the mornings too, so, all of our luxury villas have one bathroom per two bedrooms, with at least one en-suite. Browse through our breathtaking collection of Luxury villas and taste the high life. You just know any of these luxury picks will guarentee exceptional comfort and style on your villa holiday. Which villa will be the perfect fit for your luxury stay? Experience Luxury villa living with hotel style facilities at your fingertips. Holiday Resorts offer the privacy and peace of a villa holiday, while the shared pools, leisure facilities and restaurants to keep the whole family entertained.